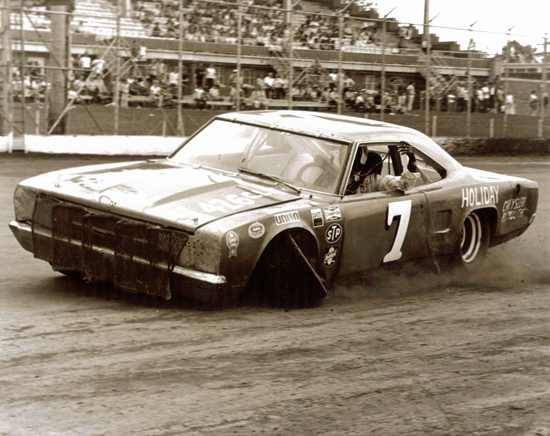 Des Moines, Iowa (July 11, 1971) – It was billed as a battle between two champions – IMCA champ Ernie Derr and ARCA kingpin Ramo Stott, both of Keokuk, Iowa, and the 15th annual Iowa 300 new model stock car race at the Iowa State Fairgrounds shaped up to that, and much, much more. Derr won the race, his sixth straight, but queer twists of fate kept Stott from victory lane. Stott and Derr battled for the lead throughout the race, keeping the 10,150 race fans on their feet, with Ramo leading more laps, and stretching out a four-second margin at one point. On lap 250, Derr attempted to move around Stott on the outside, but lost his 1970 Dodge Charger in the loose dirt, pulling him into the wall. It would be eight laps later before his car was “race-ready”, and it appeared that Derr was content on settling for second place. Ramo had slacked off, looking like a sure winner in the race he had won three times before. But trouble was lurking for Stott and his 1970 Plymouth. On lap 277, a ball joint on the left front wheel of his Roadrunner snapped, jamming the wheel and blowing a tire. Ramo Stott's wheel snapped while leading the race. Stott would continue to race, changing the tire three times, and Derr slowly started to narrow the eight-lap deficit. On lap 291, the wheel on Stott’s car came off, prompting the black flag and ending his day. Ernie and Ramo had enough laps on the rest of the field to give Stott second place, four laps behind Derr. Mike Petrucci of St. Paul, Minn., brought his 1971 Ford Torino home in third place, eight circuits behind. Gary Martin of California, Mo., was fourth, having completed 287 laps and Don Cooper of Sedalia, Mo., rounded out the top five, completing 275 circuits. The afternoon race, which took Derr 2 hours, 34 minutes and 17 seconds to complete, was worth $1,550 to the winner. The STP corporation added $250 to the winner’s prize $150 to the second-place finisher and $100 to the third-place finisher. Ramo picked up $1,100 for his efforts, including the $100 he picked up for setting fast time in qualifying. 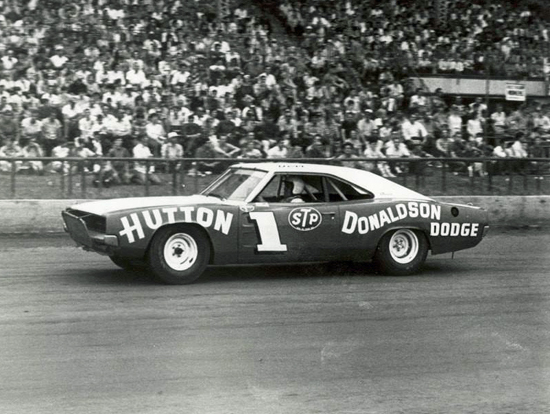 Ron Hutcherson, also of Keokuk, Iowa, was trailing Derr by only 50 points entering the contest but Hutch and his 1971 Ford Torino were plagued by a variety of problems, forcing him to settle for 14th place. Hutcherson got off to a bad start in a race he had hoped to win. He blew his oil filter on lap 116 but didn’t re-enter the race until the halfway point. Fifteen laps later, Hutcherson would pull in again with what he thought was a blown radiator but it was only a split hose that caused him to lose water. He went back on the track, only to pit again with overheating issues. Thirty-three new models started the longest race in the state, with Iowa Governor Robert Ray giving the field the green flag. Less than half the field was still running at the end, with the high temperatures and a bumpy track both taking their toll on man and machine. 3. Mike Petrucci, St. Paul, Minn.
4. Gary Martin, California, Mo. 5. Don Cooper, Sedalia, Mo. 6. Glenn Arnold, Sweet Springs, Mo. 7. Jerry Covert, Topeka, Kan.
9. Butch Hall, Russell, Minn.
11. Dean Roper, Springfield, Mo. 13. Gerry Harrison, Topeka, Kan.
15. Joe Wallace, Leavenworth, Kan.
17. Jim Hager, Liberty, Mo. 20. Verne Covert, Topeka, Kan.
23. Bill Stahl, St. Paul, Minn.